Shirala Village in Maharashtra is famous for Snake or Naga Worship and display of Snakes during Naga Panchami - in 2018 it is on August 15. The proof to it is that there are nearly Sixty Snake Clubs in Battis Shirala Village in Sangli District that display poisonous Snakes during the popular Hindu Nag Panchami Snake Festival. High Court had banned the display of Snakes and district administration has put several restrictions to prevent the capture of snakes but display of poisonous snakes continues. 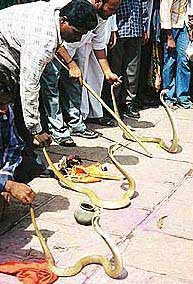 In 2002, a petition was filed by animal right activists saying that snakes were being ill treated during the festival. The High Court passed an interim order banning the display of Snakes. Since then the festival is held under strict observation of the district administration and forest department officials. The Villagers of Battis Shirala claim that they celebrate the festival peacefully without harming Snakes. Usually, around 300 poisonous snakes are on display on the Nag Panchami day. The fangs of the snakes are not removed and they are poisonous and are left in the forests after the festival. The village is about 50 km from Kolhapur. A Nag Panchami procession is organized on the festival day at Shirala. People feed milk to poisonous snake and perform special pujas. Kumkum powder, flower petals, rice, milk and money are showered on the snakes. According to the villagers, the poisonous snakes never bite during puja and celebrations. Competitions are also held between various Nag-mandals (snake clubs) for the best Cobra. The pujas are performed for a good harvest. There is a wrong belief that Snakes drink milk. Forcefully feeding snakes is crude and capturing snakes and parading them should be avoided. Festivals like Nag Panchami is meant to spread the message that all living beings need to co-exist peacefully in Mother Nature. Human beings are a subsystem, Snakes are a subsystem and numerous such subsystems join to form the large system – Mother Nature. Destruction of any one system will lead to imbalance in the large system. Our ancient saints had realized this and created festivals and rituals to keep people close to Mother Nature and to learn to live in harmony. But sadly we have made rituals and festivals into a mockery.